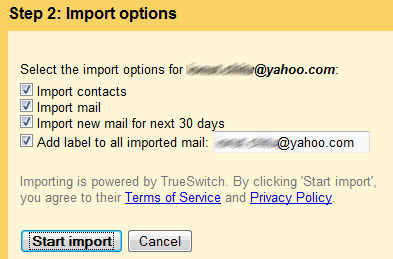 How to Import Contacts And Messages From One Webmail To Another ? , you don’t want to lose your old messages and the address books, what can you do? In such a situation, you can use the Mail Fetcher feature offered by Gmail. It is supposed to work with all mail services like POP, comprising Hotmail and you can’t use this for your regular Yahoo Mail accounts. Already there is a feature available that lets you import contacts and mail from popular services like Yahoo Mail, Hotmail, AOL Mail and from ISPs like Verizon, Comcast, Earthlink. If the tab is not available named "Accounts and import" in Gmail's settings, then you may have to wait until the feature is enabled for your account. Now it is much easier to make the transition with this feature. Moreover, it is very easy to get the forwarded messages to new account from your old account for 30 days. This service is provided you by TrueSwitch, which can offer similar migration wizards for Hotmail and Yahoo Mail.